Our 2018 Rose Cuvée is made from two different sites on the property. The majority of the fruit comes from our Grenache and Mourvèdre plantings in the China Bowl block, which sits on shallow, rocky soil near the foot of the property. This steep, well-drained site offers a crop with excellent concentration, providing an abundance of vibrant fruit character. The remainder of the grapes came from Grenache, Syrah and Viognier vines organically grown on our two-plus-acre parcel named Bobcat Run. This block takes its name from a large resident feline that treats us to an occasional sighting. The site is ideally suited for growing Rhone varieties as it lies in a fairly cool hollow open to the southwest, and its rows run north-south for good sun and warmth without excessive exposure. The cooler conditions in Bobcat Run produce fruit with a great depth of flavor, adding nuance and complexity to the intensity of the fruit from China Bowl. The overall weather during the growing season in 2018 got off to a cool start and mid-summer weather not overly hot either. An early weeklong September heat spike pushed sugar levels up then subsiding and eventually allowing for optimum ripeness. Harvest started two weeks later than the previous two years. Our Rose Cuvée was created in the vineyard, where we make an early pass through our Rhône varietals and cull out just enough fruit for this blend. Lightening the crop remaining on the vines had the added benefit of increasing the concentration of flavor and color in the grapes that eventually made up our 2018 Grenache and Cuvée Alis. Just over one ton of the four varietals combined were picked on September 5, 2018. The 2018 Rose Cuvée is a finely balanced wine that reflects our meticulous organic farming, fine-tuned crop management, and judicious winemaking. To achieve the precise color of this wine, we destemmed the grapes into fermenters and allowed them to macerate on the skins for just less than 36 hours. When the color of the juice was just right, we pressed it off and then fermented it at a low temperature in stainless steel. 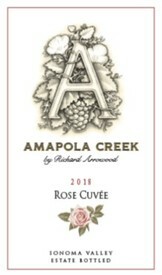 The Rose Cuvée is a blend of four traditionally Rhône-grown varieties — Grenache, Mourvèdre, Syrah, and Viognier. Hold this wine up to the light and notice its beautiful dusky rose color. Swirl the glass, and you will find clean notes of melon and raspberry, with just a hint of honeysuckle. Take a sip, and you will notice a surprisingly rich mouthfeel balanced against a crisp acidity, over a background of bright red strawberries and citrus peel. Note that the finish on this wine is uncommonly long for a Rosé and has a slight flavor of honeydew. This dry, floral, and fruity wine is very seductive on the palate and is an ideal complement for spring and summer cuisines. Drink now and over the next year until the next vintage arrives.